Tracy, a MAM Leawood mom, was filled with gratitude when she was chosen to participate in the 2016 MAM Christmas Store. “We had lost our home and everything in it to a fire and then my car broke down. I had prayed and prayed that somehow, someway, God would provide a little bit of happiness for my kids.” Upon hearing from Jeff, the MAM Leawood neighborhood director, that her four children, ages 7 to 13, would have presents to open on Christmas Day, Tracy broke down and wept. Will you help us bless MAM families again this year? Each year MAM chooses 30+ families from our eight gyms to participate in the Christmas Store. 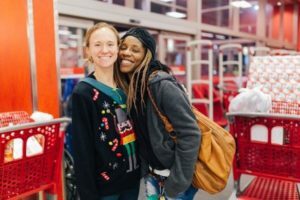 These moms, dads, and guardians will shop on December 12 with Target gift cards alongside MAM coaches. These caregivers will enjoy a meal, hear a Gospel presentation and receive a Bible. Faithful volunteers will wrap each child’s presents and load them into a shopping cart. The MAM Christmas Store is more than a means to providing our children with toys and clothes. It is intentional evangelism, a platform for sharing and modeling the Good News of King Jesus to the families we serve. • Your giving lets our parents choose gifts for their children. • Your giving lets the Good News be spread into the homes of our MAM children. • Your giving provides hope. Isn’t giving what Christmas is all about? Friends, we ask that you consider donating to the MAM Christmas Store – giving more moms, dads, and guardians hope in King Jesus this Christmas!